Go to the Merlin Mystery Solution Index. This is Part 4 of my solution to The Merlin Mystery (“MM”) by Jonathan Gunson and Marten Coombe. This post provides the complete solution to the Pyramid mini-puzzle. In part 3, we established the chain of objects that links the Pyramid to the Nimue symbol (“Nim”). 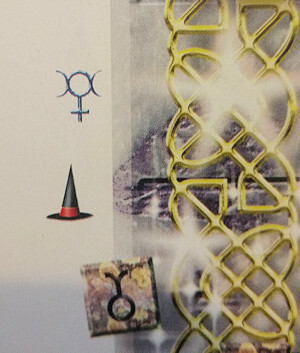 This part goes through the clues that in turn link the Nim symbol to the zodiac signs and the witch hats. These sets of symbols provide the first step to solving the puzzle. Most of the clues linking Nim to the Zodiac and the witch hats are on P28. In the main picture sits Nimue, wearing little more than a black Nim necklace. Surrounding her is a golden circle of zodiac symbols that are part of a larger clock face. Then in square S0, at the top of P28, a butterfly with Nim symbols on its wings sits in another ring of zodiac symbols. This clearly links Nim to the zodiac. The golden clock face appears again in P28,S35. 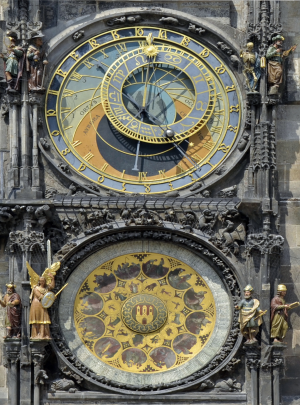 This face is from a real astronomical clock located in Prague. The clock in S35 also contains a witch’s hat. This links the hats with Nimue (which makes sense since she is a witch) and therefore with the Nim symbol. Another link between the witch hats and Nim is on P6,S16. 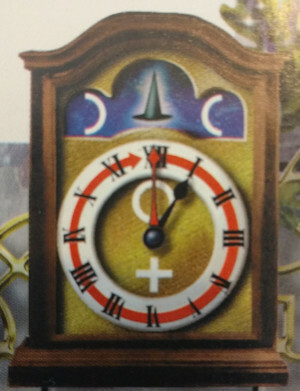 The clock in this square features both a witch hat and the broken apart pieces of a Nim symbol. So we have a whole series of objects and symbols which are repeatedly linked to one another: the Pyramid, Nim, the zodiac and witch hats. The first step to solving the pyramid puzzle is to hunt down all the Nim symbols, zodiac signs and witch hats scattered through the book. Starting with the zodiac signs, there are lots of them etched into the copper tiles around the border of every page. However, we know from Part 3 that the copper tiles are linked to the Cuboid solid, so we’ll ignore those for now. More distinctive zodiac signs appear on 6 different pages. Z2, Taurus, is on an illuminated manuscript on P6,S4. Z1, Aries, is on a green sphere on P8,S0. Z9, Sagittarius, is on a purple tile on P14,S32. Z5, Leo, is on a stamp on P22,S16. Z6, Virgo, is on a 4-piece jigsaw on P35,S20. Finally Z11, Aquarius, is on a stone tile on P42,S40. Only half of the zodiac is represented, but they appear in order starting from Z1 on S0 and going round clockwise with a new one every 4 squares. The 4 square gap between signs is most easily seen by flicking between P6 and P8. Every 4 squares round the 48 square border is a “zodiac point” associated with one of the 12 different signs of the zodiac. This connects back to the clock on P6,S16 with a witch hat and Nim symbol. The time is 1 o’clock and a big red arrow goes all the way round clockwise. 12 numbers on the clock equals 12 signs of the zodiac. Yet another clock face pointed at 1 o’clock appears on P10, S0. This is on the page immediately after the Aries (Z1) sign also appears in S0. Both images have a stone relief of a woman’s face next to them to confirm the connection. The zodiac signs go round the border like the numbers on a clock, with Z1 at the 1 o’clock position in S0. Nims appear on the necklace worn by Nimue on P28 and again on P38. There are also the Nim symbols on the butterfly on P4,S0 and P28,S0. These create the association between Nim, the zodiac and the Pyramid. 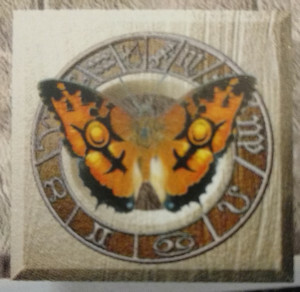 Nim also appears on a banner on P16,S27, but once again we know from Part 3 that the banners along with the copper tiles are connected with the Cuboid puzzle. We’ll ignore the banner for now. A large silver Nim symbol appears once on every page except P2 and P44. It always appears just inside the border next to a different border square. The first silver Nim symbol is on P4,S0, right next to the the butterfly with the Nims on its wings. Further down this post, there’s a table listing all of the squares where the Nim symbol appears. This table helps reveal some important patterns. There are witch hats inside each of the clocks on P28,S35 and P6,S16. These hats are all-black and create the association between the hats and Nim. The rest of the book is filled with red-banded hats. These appear on every page except P2 and P44, and there are either 3 or 4 of them per page. Further down this post, there’s a table listing the number of hats on each page. Only the number of hats matters, not their locations. There are also a couple of blue wizard hats. These are red herrings. Nim symbols only appear on squares that are multiples of 4, the same squares that are associated with zodiac signs. The Nims move round the border by either 12 or 16 squares between one page and the next page, i.e. by either 3 or 4 zodiac points. The number of hats on a page (3 or 4) is equal to the number of zodiac points that the Nim symbol moves round between that page and the next. There are 75 hats in total (I’ll explain why this is important later). Now that all the pieces of the Pyramid puzzle have been brought together, the next step is to interpret it. This requires thinking back to what we’re trying to achieve: solving the puzzle requires identifying a sequence of border squares. The Nim symbols clearly indicate 12 special squares. They also hint at a specific sequence as the silver Nim moves clockwise round the border from page to page in a regular way, controlled by the number of witch hats on each page. On P36, we see Nimue firing a lightning bolt across the page. The hint is that the 12 zodiac squares are the starting points for drawing lines across each page. It all starts on P4, S0. This is the first page having a Nim symbol or any hats and there is a giant Nim-winged butterfly in square S0. S0 is also the first zodiac square: Z1/Aries. The first line we draw will start from this square. There are 3 hats on that page and this suggests that we need to draw 3 lines. But all three lines do not start from S0. The hats are also associated with the clockwise pointing clock on P6,S16, which suggests going round the 12 zodiac points in clockwise sequence. The 2nd line will start in S4 (the Z2/Taurus square), the 3rd line in S8/Z3. This pattern works when we turn over to P6. On this page the Nim symbol is in S12, indicating that our first line on this page starts from there, the next zodiac square in the sequence. There are 4 hats on P6, meaning that there are 4 starting squares on this page: S12, S16, S20 and S24. Turning the page agin to P8, the Nim symbol appears at S28. Once again, this is the next zodiac square in the sequence. We’ve found a pattern and it works on every page of the book. There are 75 hats in the book. This suggests that we need to draw 75 lines from 75 different zodiac squares. This further suggests that the final solution to the puzzle is made up of a sequence of 75 different objects. Something tells me this is going to be a lot of work! But where do these lines go? The Pyramid is only the first in the line of 7 solids. The Zodiac squares are only starting points. The next 6 solids will take us from these starting points to a finishing square. A hint of where to go next is in the picture on P36. The lightning bolt fired by Nimue hits Merlin. This suggests that the lines starting in the Zodiac squares go towards something connected with Merlin. From Part 3 we know that Merlin is connected with the Cone solid and, indeed, the Cone is the second solid in the line. The Pyramid puzzle has been solved by making symbolic references between many different objects. This puzzle has given us 75 starting points as part of our task of creating a list of objects that represent the final solution. The next part of the solution will go through the Cone puzzle in an effort to learn where the lines that start in each zodiac square go. Each of the 7 solids mini-puzzles are solved in much the same way as the Pyramid puzzle. Now you know the internal “logic” of the book, have a go at solving the Cone puzzle for yourself before reading on. As a hint, we learned in Part 3 that the Cone is linked to the spitfires and the Mer symbol. Confusingly, the Cube is also linked to the Mer symbol. By working out a pattern made by the spitfires it is possible to resolve this ambiguity and focus on exactly which symbols are relevant to the Cone puzzle and which are relevant to the Cube puzzle which follows it. You mention Nimue on P36 a couple of times, but I think you mean P38. Thanks again, great work! Loving it!